Wondering where your IRS tax refund is? It’s easy to find out by clicking HERE. With a key May 15 filing deadline facing many tax-exempt organizations, the Internal Revenue Service today cautioned these groups not to include Social Security numbers (SSNs) or other unneeded personal information on their Form 990, and consider taking advantage of the speed and convenience of electronic filing. Our own Jayne Frazier was recently awarded an Honorary Life Membership in the General Federation of Women’s Clubs of North Carolina (GFWC-NC). The award was presented at the GFWC-NC’s annual convention, in recognition of her 17 years of dedicated service to the Charlotte Women’s Club, the GFWC Junior Women’s Club of Charlotte, and the Charlotte community. Congratulations Jayne! We’re so proud of you! 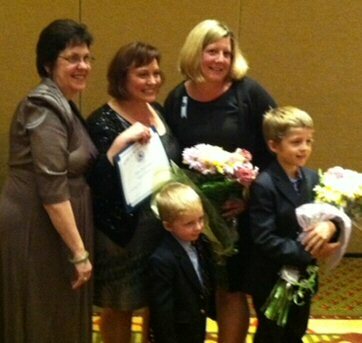 Pictured: Back row L to R: GFWC-NC President Wendy Carriker, GFWC-NC Junior Director Crystal Sharpe, Jayne Frazier. In the front row are Mrs. Frazier’s two sons who were on hand for the award ceremony.